Drums and basses are the stalwart, steady soldiers in the army of rock. Less virtuosic than the guitar, not as varied as the keyboard, but so utterly and inextricably bound to good rock and pop that to leave them out would be to leave a song without a soul. 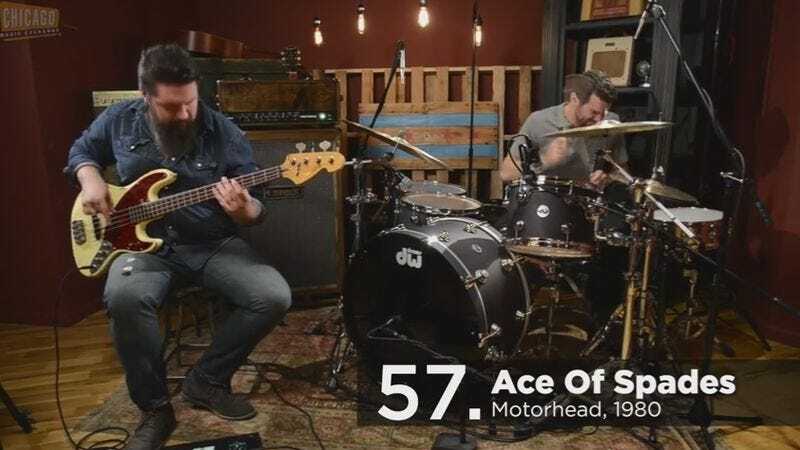 In celebration of these unsung heroes, the Chicago Music Exchange has put together “100 Bass Riffs: A Brief History Of Groove On Bass And Drums,” a single-take session featuring bassist Mark Najjar and drummer Nate Bauman playing their way through bass riffs from 58 years of rock history. The video—a follow-up to the guitar-centric piece CME had a big viral hit with a few years ago—opens with Fats Domino’s “Ain’t That A Shame,” and finishes, 17 minutes later, with Queens Of The Stone Age’s “My God Is The Sun.” Along the way, Najjar and Bauman seamlessly transition from blues to rock, pop to metal, and every genre in between, covering bands from Green Day to Joy Division, and artists ranging from Marvin Gaye to Ozzy Osbourne. Even as the music skips from style to style, there’s something unavoidably soothing about the soft growl of Najjar’s bass and the steady drive of Bauman’s drums. If nothing else, the video is a testament to the skill of the two musicians—both members of Chicago-area band Royale—as well as their coordination and endurance.